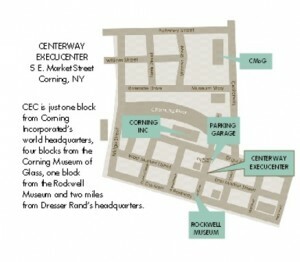 Centerway Executive Center is in the heart of vibrant and historical Corning, New York. We are conveniently located just 1 mile from the intersection of Interstates 86 and 99. The Elmira-Corning Regional Airport is 7 miles from our offices and is served by Allegiant, Delta, American Airlines, as well as charter, corporate and freight flights. Take Interstate I-86E (NY-17E) to Exit 46. Take exit 46 for NY-414 , turn downhill (south) at end of exit ramp toward Corning Museum of Glass. Follow NY-414 S to E Market St. across the bridge. Take the 2nd right turn onto E. Market Street. Centerway Executive Center is on your right at the end of the block, adjacent to Centerway Square and next to the clock tower and the municipal parking garage. Park and enter the lobby of the building through the door at center of the Market street side. Proceed up the elevator or the stairs to the second floor. On Bridge Street and Market Street customers can park FREE for not more than 2 hours Monday through Saturday, 8am–6pm. $5.00 for a full day of parking if you enter the garage before 1pm Monday through Friday. After 1pm the cost drops to $3.00. Park in any available space and remember the number. At the parking lot pay station, follow the instructions on the display screen. For a City of Corning Parking Map please Click Here. Across the street from Tony R’s Steak & Seafood Restaurant, Heels & Hobos, Irvine Wealth Planning. Only one block from Corning Incorporated Headquarters, The Cellar, Donna’s, Three Birds Restaurant, Tommy Hilfiger Outlet Store. Two blocks from Rockwell Museum of Western Art, Corning Radisson Hotel, Holmes Plate, Gaffer Grille, Sorge’s. Across the Centerway Bridge from the Corning Museum of Glass and Slammin Jammin BBQ.